Ninja of the Deep Hours—or “Ophidian Ninja”—was the gimme. Once the design team nailed down the very first design parameter for ninjas—that they would have saboteur abilities (abilities that triggered when the creature damaged an opponent in combat)—Ophidian Ninja was bandied about as the poster-child for the new class. “They'll all have saboteur abilities,” R&D members repeated to one another, a hundred times over. “Like… like… draw a card!” Okay, that one's easy. What else could they do? We weren't sure. “Draw a card” is a pretty safe bet to appear on a blue card any time we introduce new mechanics, but we couldn't really nail down how powerful the other abilities could be until we knew exactly how ninjas worked. Now, I admit that, going into Betrayers of Kamigawa, my view of ninjas was really skewed. I'm the R&D lead for the GI Joe TCG, and that brand boasts two major characters that happen to be ninjas—Snake Eyes and Storm Shadow. Those two are easily the biggest badasses in the universe, and everyone knows it. They can best anyone in a fight, and both have been known to take out ten or twelve opponents in the same brawl. Ninjas, historically, were not like that (which is sad, really). Brady Dommermuth broke my bubble numerous times by informing me that ninjas want to avoid fighting at all costs. On top of that, if a ninja was ever in a “fair” fight against a samurai, the ninja would definitely lose. They were supposed to be sneaky and covert and stay out of harm's way. Bummer. Many mechanics were brainstormed (see Mark Rosewater's Higure preview for more detail), some of which involved saboteur abilities, some which didn't; I had the feeling we'd eventually settle on some kind of saboteur thing. For my part, I made a push to bring back the “shadow” mechanic from the Tempest block. It seemed to fit so well… the ninjas would avoid combat with other creatures (but could battle one another), they'd always slip by opposing defenses, and their saboteur abilities would come up a lot. Randy Buehler is the department's most vociferous critic of the shadow mechanic (he believes it removes interaction, which is one of the worst things you can do to a game), so it was very big of him to even allow us to test ninjas with shadow. As you might imagine, the experiment was a failure. How much should you charge for a creature that hit for one damage and drew a card every turn… and was essentially unblockable by anything? We tried four mana for a 1/1 shadow ninja Ophidian, but that was still way over the top, especially for a card we hoped would be common. One thing we wanted to avoid was having the ninjas all be really expensive and really small, since no one likes those kinds of cards very much. Fortunately, Rosewater came up with the “sneak” mechanic (which would become ninjutsu). We had a mechanic… now we just needed to nail down the individual cards. An aside on ninjutsu… In Mark's Higure article, he mentions how he views the flavor of the ninjutsu mechanic. In his mind, the ninja are disguising themselves as things like Ornithopters and Durkwood Boars, and then unzipping their costumes at the last minute to do their dirty deeds. It probably goes without saying that other members of the creative team find this explanation a little silly and don't really endorse it. There are a couple of other ways of wrapping your brain around ninjutsu. 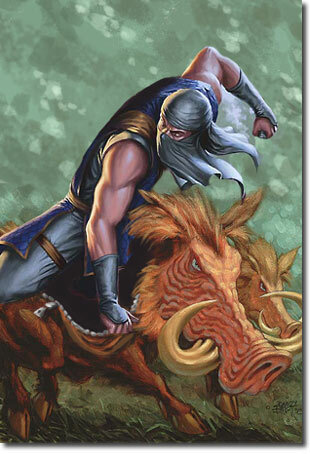 For instance, imagine the ninja is using the Ornithopter or the Boars merely as a diversion, sneaking behind enemy lines while the opponent's gaze is directed elsewhere. Or, you can visualize our ninjas as having magical powers of illusion, powers they employ to deceive potential defenders. Or, if you like, you can continue imagining a ninja unzipping a boar suit just before he stabs you in the stomach. Ninja of the Deep Hours. For a while, this fellow was a 1/1 that cost 1U to play and U to sneak. In many matchups his ninja ability was irrelevant—he was simply a cheap card-drawing machine. Toss in tons of Boomerangs and cheap counters and it was really easy to get way ahead with him. He was eventually changed to a 3U 2/2, but his ninjutsu cost remained at U, and he remained troublesome in the early game. The solution was to up his sneak cost to 1U. Walker of Secret Ways. This card was slated to be a moonfolk ninja. It flew, and its saboteur ability was to mill your opponent. It also had a normal “moonfolk” ability to return ninjas to your hand that required you to return lands to your hand to activate it, but all that didn't fit on a card (flying + ninjutsu + saboteur ability + moonfolk ability). So it, like the other blue ninjas, became human. Even so, the milling ability still didn't fit on the card—the ability we found that could fit in such a small space was the “peek” ability there now. 2B. Turn 2 Nezumi Cutthroat, turn 3 take four and discard two. Seriously. The power level on this card was so high that I likened it and the powered-up Ninja of the Deep Hours to Basking Rootwalla and Arrogant Wurm in Multiverse. It's worth mentioning that lead developer Henry Stern (as well as Paul Sottosanti, I believe), really wanted to see this card to be good enough for serious constructed play. The problem was that it felt like there was no real middle ground to be had. If a card is going to come out of nowhere and make you discard two in addition to whacking you for a decent chunk of damage, it just couldn't be too efficient. One hit often decided the game. Skullsnatcher. Of note is the fact that the original version of this card removed the entire graveyard when it hit you, not just two cards. Throat Slitter. There are old comments in this card's record from back when the set was still in design. There was discussion about having every blue ninja be able to unsummon itself for U, and every black ninja being able to regenerate for B. While these abilities would convey the flavor that ninjas did whatever it took to survive, there was no way they could have fit on cards. Ink-Eyes. At one point, this card had the type Legendary Creature – Human Demon Spirit Ninja. I have no idea what that could possibly mean, but I'm glad it changed! Ink-Eyes was almost another victim of the dreaded “text-squeeze”—a few days before the end of development, her regeneration ability was dropped because it didn't fit. But just in the nick of time, the templating team came up with shorter reminder text for ninjutsu, allowing Ink-Eyes to get her groove back. You can return one ninja to your hand with another. Let's say you attack with an Ornithopter, your opponent doesn't block, and you sneak in a Ninja of the Deep Hours, which your opponent promptly tries to Magma Jet. If you have the mana and another ninja, you can “gate” it in, saving the first ninja. You can return multiple attackers with the same ninja. This one's weird, I know (thanks to Alan Comer and Mike Feuell for alerting me to it). Attack with two Ravenous Rats. If your opponent doesn't block, pay the cost to sneak in a ninja, then pay the same cost again before the first one resolves! Voila—one ninja in play, two rats back in hand! Did you already know the correct interaction between Kiki-Jiki and Genjus?